This is a hike I did August 26-27. This is not to be confused with Deception Pass in the Puget Sound - this Deception Pass is on the Pacific Crest Trail on the East side of the Cascade Mountains. 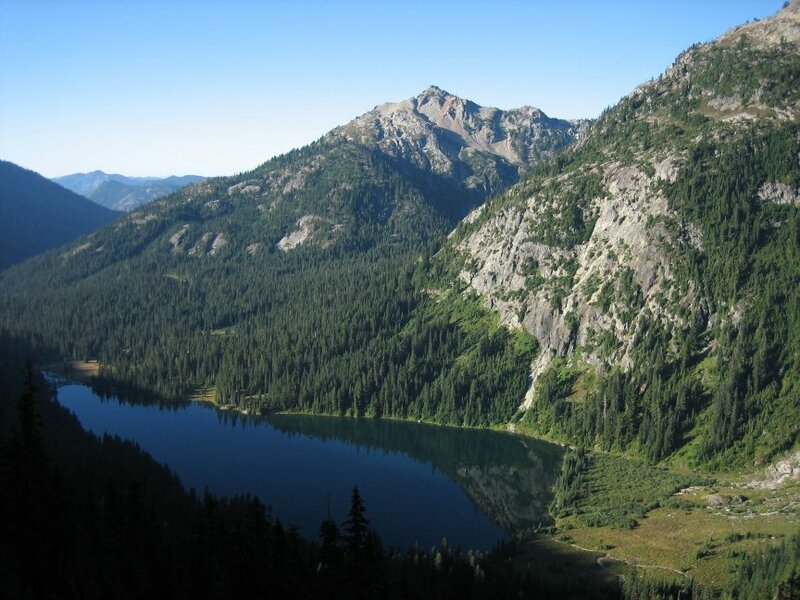 This part of the PCT is in the Alpine Lakes Wilderness which is one of the prettiest parts of the country. 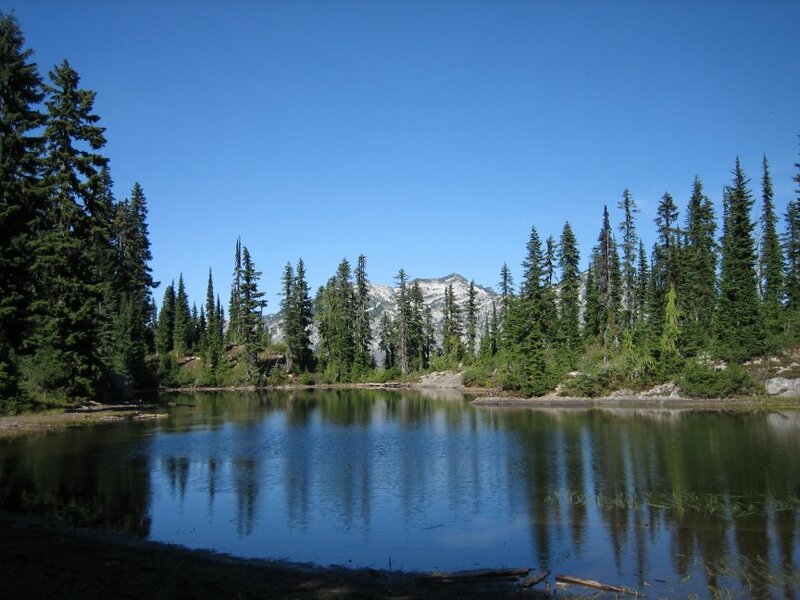 I had hiked on the PCT south of here three years prior at Pete and Waptus Lakes and was eager for a second outing. 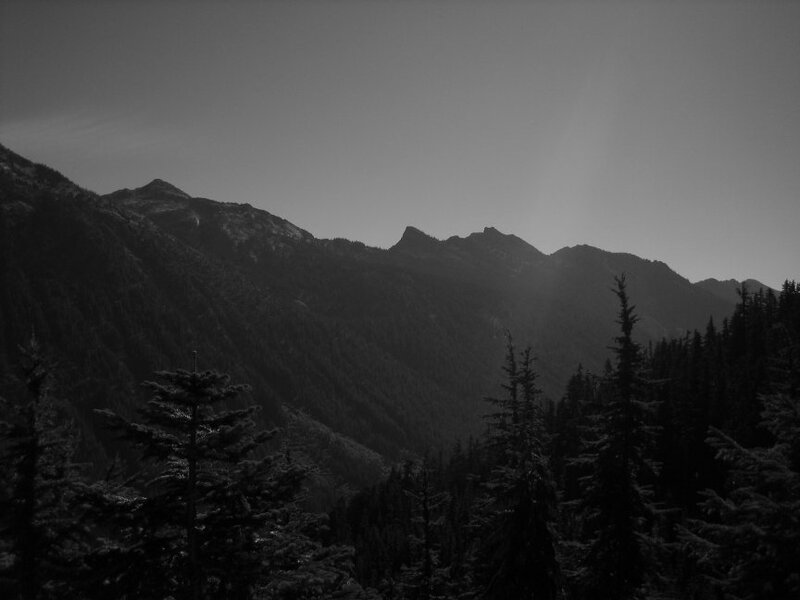 I must say that hiking and backpacking in the North Cascades is wonderful. The trailhead is at the end of road 4330 north of Cle Elum and Roslyn off I-90. I took the path west from the trailhead and this takes you from the valley up to the mountains rather quickly. 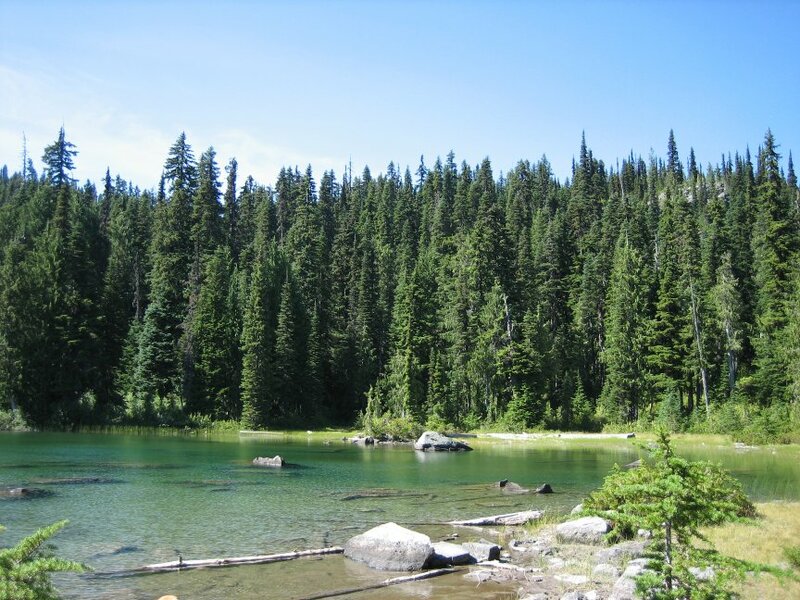 For the first couple of hours you are in forest but eventually you reach Squaw Lake which the first stop of the day. The hike started rather ominously when I put on my pack and realized I had water dripping onto me. This of course was the first time using my new Bora 50 so I was a bit put off. I unpacked the whole thing and could not find anything wet so I wrapped my bladder in an extra garbage bag (always bring extra!) and off I went. BTW, this was also the first trip with my new down sleeping bag so I was a little worried that it would get wet and be worthless later that night. Thankfully I was wrong. The rest of the ascent was rather uneventful save for the wasp that decided I had irritated it enough to retaliate and sting me. This proved a little annoying the rest of the trip as the bite was right on my sock line. Alas, I had something to keep my mind on while the rest of my body started going into the numbness of pain. I met a group at Squaw Lake that had been backpacking for a week. A group of boys and fathers and they had been swimming and fishing along the way. Certainly a good adventure before coming back to school. Once above Squaw the views start to open and you can see the mountains on the other side of the valley. Quite remarkable. You pass several other smaller lakes on the way and then finally the view opens to reveal Cathedral Rock. This is by far the best view of the rock. It is reminescent of Devil's Tower in Wyoming (made famous - or more so - by Close Encounters of the Third Kind) and is quite majestic. The spire is quite incredible. This path takes you up to the PCT (I found out later that the path I was on is a detour for those with animals as there is a fairly difficult stream crossing that would be more so for horses). 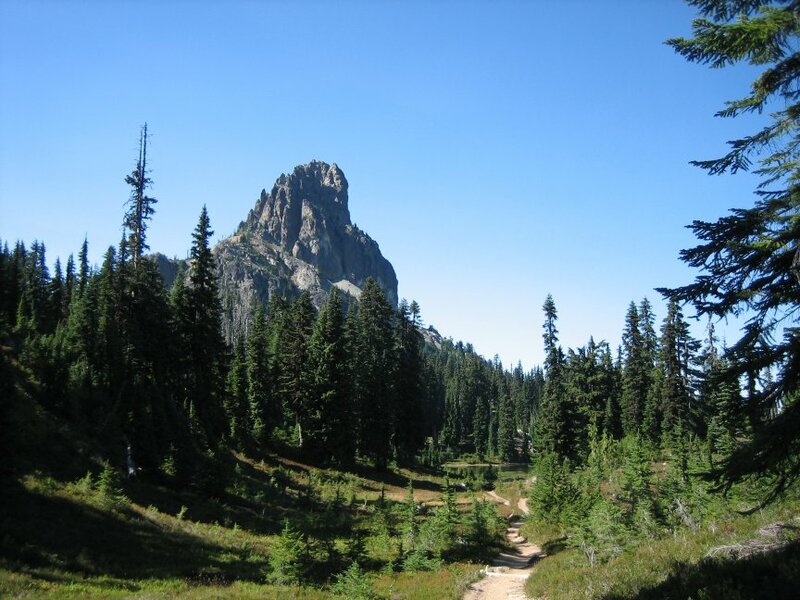 As I approached I ran into some fellows on horseback that truth be told I thought was a bear until they reached the crest I was approaching (you hear loud noises and see dust - what would you think?). They were shocked as well given that the terrain hid me until I called out to them. This was the third and final group I would see on the first day. The top is 5600' and at this point I decided to turn south and head around Cathedral Rock to camp at Peggy's Pond. At this point you are on the PCT for just a 1/2 mile before you come to a "hiker's only" sign. This is the route to the pond. Along the way you are on the rocky slide under Cathedral Rock and the "moderately maintained" trail is a bit treacherous if you are not watching yourself. 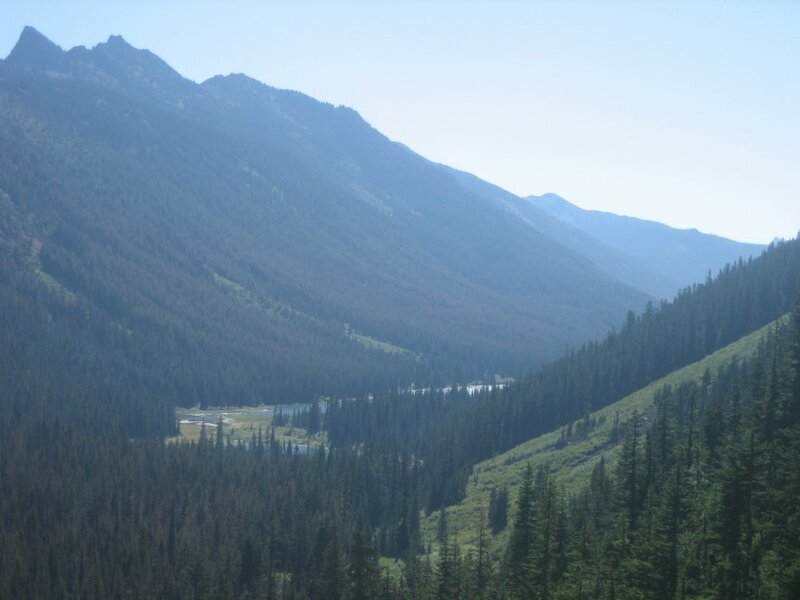 However, it is well worth it as you have views of Deep Lake and the valley beyond that are beyond spectacular. I reached Peggy's Pond early - around 5:30. I setup camp and read for awhile. One other group camped across the pond from me but we did not cross paths. Dinner was beef and onion freezed dried surprise. It was not bad especially when you consider that I used 1/2 the water I was supposed to. The final episode before bed was not terribly successful - hanging the food sack. First problem was there was little flat ground to work off of which is difficult. Second is that there was nothing of substantial weight to tie to the rope. Third is that the rope itself was just not suitable for the task. After about 30 minutes in vain trying to get the stupid rope up over the stupid branch I decided to risk it and hid the sack away from the tent under some rocks. If I lost my food, well, I guess I would just deal with it :-). The night was uneventful other than the fact that I was sleeping under Mt. Daniel and Cathedral rock next to a still pond - AMAZING. I did wake in the middle of the night to do some business and the stars were just incredible - I think we forget how many stars there really are when there is no light to drown them out. I think I saw the milky way for the first time in years. The night was absolutely clear. Quick side note - I did have very good weather during the trip. I don't know that I saw a cloud of note the entire trip. About 5am the wind was really whipping. My Golite Hex 3 is quite amazing but I didn't have it guyed properly for the wind and so I felt it. Actually, the wind changed directions during the course of the evening so I would have had to totally guy down to make a difference. I would suspect we had 35mph gusts that night. Morning was morning in the wilderness - eat, pack, move out. Bacon and Eggs was the order of the morning which was fine. I was on the road by 8am. I met a dude on the way to the Peggy's Pond trail that had camped at first pond (Peggy's is the 2nd). He was climbing Mt. Daniel that day - more power to him. Did I mention the lack of clouds? Well, at 8:30 climbing around Cathedral Rock to the East the sun hits you smack dab in the face. Good Morning! On I go along the PCT and right at a time where it starts the switchbacks down to a resonable altitude. This is a time not to get careless with one's footing. Seriously. And I won't forget to again. So, I got careless and stepped right off the trail with my right foot and damn near slid off the mountain. Now this wasn't a ledge but it wasn't a ditch either. I calmly did not struggle at first until I realized I was sliding! So, life seems to run in slow and fast motion in these times and I remember thinking this was bad and threw my upper body to the left and pulled myself up. After a short moment of reflection on how glad I was that no one was around to see this little episode, I pulled myself up and carried on. From Cathedral Rock to Deception Pass on the PCT is about 5.5 miles and I got there by noon. This involved two stream crossings that were pretty rocky and got my boots wet. 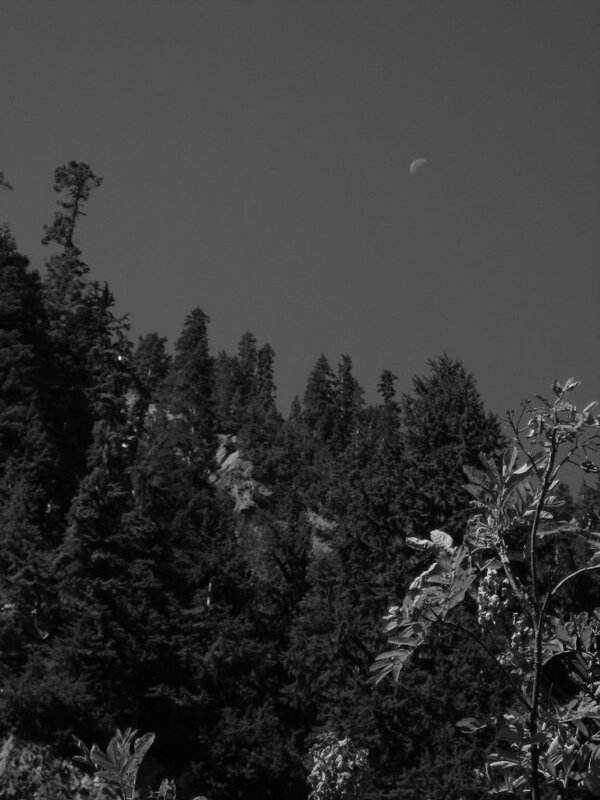 This also involved a very nice and solitary hike with the moon following me along the western horizon. Vistas to the east across the valley remained and I periodically could see Lakes Hyas (little and "regular" I guess) below me through the trees. I saw only two groups on that stretch and this was only toward the end (yes, yes, yes - I could have passed someone earlier if only I'd been on the trail...). 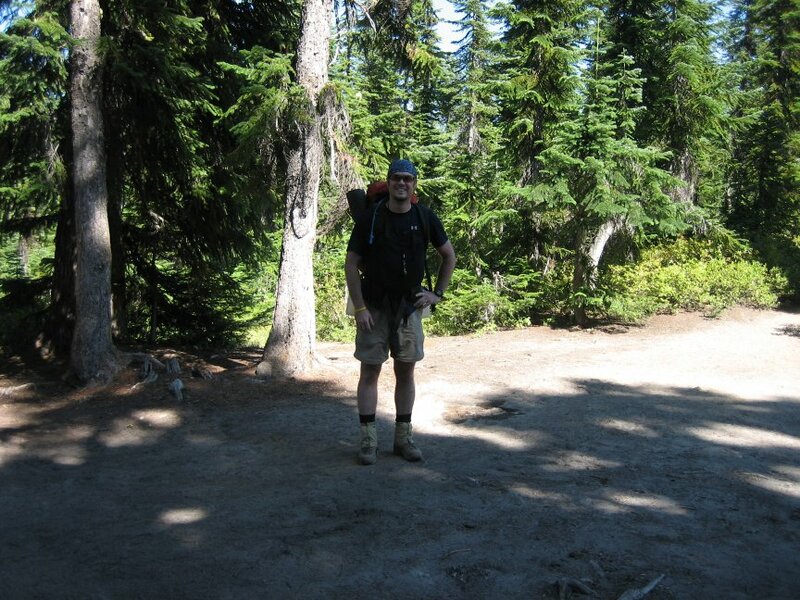 The first was three guys doing the Stevens to Snoqualmie Pass section of the PCT - something I aspire to in reverse. They did 5 miles the day before and were planning on doing this in 6 days. Well, this section is 67 miles or so so do the math - I sure hope they made it! The latter group consisted of two guys about 1/4 mile from Deception Pass. Now at this time I origially planned to head up to Marmot Lake but I had made good time to Deception Pass and frankly felt like heading home. I had been out of town that week and so really wanted to get some sack time in the old bed that weekend. I headed south. It's all downhill from here as they say. 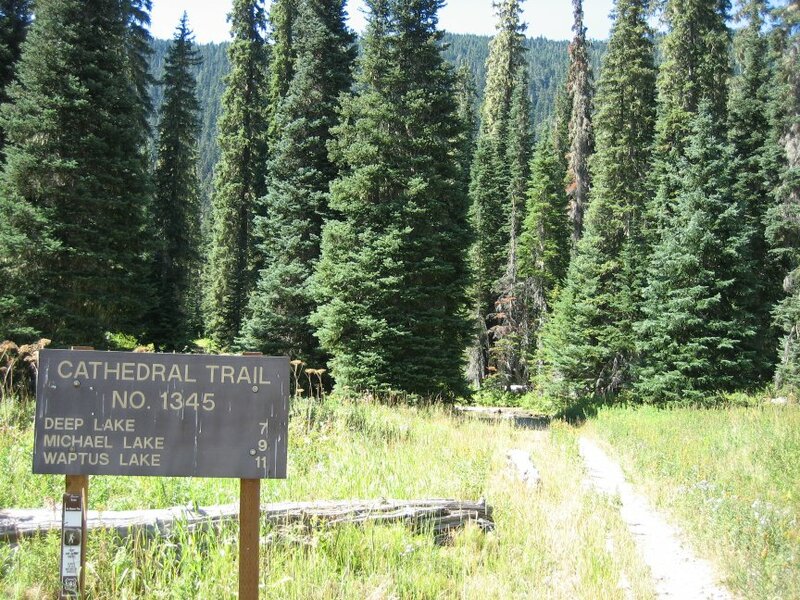 This part of the hike is mostly in the woods other than some patches where you are hiking along Hyas Lake. Remembe how I saw 5 people on the first 4 hours? I saw that many in 2 minutes on this section. All told I'm sure I saw 50-60 people. About 1/4 mile is is the turn off to Robin and Tuck Lakes. Never ever go there please. The trail is totally trampled do to high foot traffic and is better to be left alone. The sheer number of people heading up there compared to the number I had seen to this point is an indication of how heavily it's traveled. Alas, I will never see these two beautiful lakes. The rest of the hike was the usual last few miles. Several people along parts of the trail as dayhikers or overnighters who only want to travel in so far. I made it back without further incident. All-in-all a very pleasant hike. The views are incredible and the weather was gorgeous. I will definitely come here again but may avoid Hyas Lake and do a loop through Deep Lake and Waptus Lake to the south (there is a connector at Squaw). Marmot and Jade Lakes will be explored one day.